Blend gelatin with juice and whipped topping for our Fruity Summer Pie Recipe. 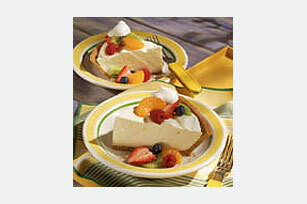 Guests will be asking for your summer pie recipe after enjoying this treat! Stir boiling juice into dry gelatin in large bowl at least 2 min. until completely dissolved. Add enough ice cubes to cold juice to measure 1 cup. Add to gelatin; stir until slightly thickened. Remove any unmelted ice. Add 2-1/2 cups of the whipped topping; stir with wire whisk until well blended. Refrigerate 20 to 25 min. or until mixture is very thick and will mound. Refrigerate several hours or overnight. Top with the remaining whipped topping and fruit just before serving. Store in refrigerator. Enjoy your favorite foods on occasion, but keep portion size in mind. This pie makes enough to serve 8. Prepare as directed, using JELL-O Strawberry Flavor Gelatin.